Ten years ago Peterborough United would have considered a 1-0 defeat at the biggest club in League One as a mighty effort from plucky underdogs. The arrival of a passionate, ambitious multi-millionaire (a decade ago today, September 18) prepared to splash the cash on his new purchase changed all that. Now, after a decade which has included three seasons of Championship football, the feelings after a narrow defeat at the hands of Sheffield United at Bramall Lane include disappointment (the fans), frustration (the players) and anger (the manager). Posh star Marcus Maddison shoots at goal during the 1-0 defeat at Sheffield United. Photo: Joe Dent/theposh.com. Darragh MacAnthony, the man who has changed a few thousand mindsets, watched from afar and appeared pretty relaxed as far as it’s possible to tell on social media. 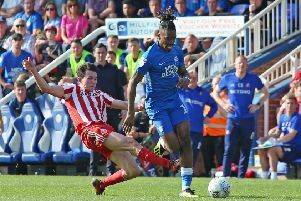 He remains optimistic his goal of returning Posh to the second tier is a possibility and watching this strangely subdued clash between two teams involved in plenty of free-scoring games this season did little to dampen his enthusiasm. If the Blades are promotion favourites then Posh are not too far away either. Certainly the home camp celebrated their narrow success as though victory over one of their major League One rivals had been achieved. The final scoreline was probably about right. The home started the game far better and scored on 13 minutes through Matty Done, just five minutes after the same player had been denied by a brilliant save from Posh ‘keeper Luke McGee, and they closed the game out with tremendous professionalism in the final stages (in contrast to the Keystone Kops’ efforts of Posh the previous weekend). But in between Posh played enough good football to ensure ‘The Blades’ were never entirely comfortable. Indeed Posh were so dominant in the second half of the first half, Blades boss Chris Wilder was forced to change a formation that had steered his side to three straight wins. Posh centre-back Michael Bostwick on the ball during the 1-0 defeat at Sheffield United. Photo: Joe Dent/theposh.com. But Posh manager Grant McCann spurned an invitation to claim his side were unlucky losers. It was bad play (most notably, a slow start, poor decision-making when going forward and the lack of a killer instinct in front of goal) according to him, confirming the high standards he demanded as a player have followed him into management. According to one set of statistics, Posh rained 18 shots on Simon Moore’s goal, but most were from distance and lacking in venom. They created just two clearcut scoring chances despite the majority of possession with Paul Taylor failing to control Leo da Silva’s perfect pass when through on goal (he recovered to force a fine save from Moore, but the big chance had passed) in the first-half and substitute Gwion Edwards failing to convert from six yards after fellow replacement Deon Moore, who was making his Football League debut, had set him up 20 minutes from time. Simon Moore made a fine block, but McCann was adamant Edwards should have scored. He also admitted he might have made a mistake in not starting Edwards who certainly pepped his team-mates up when arriving as one of three 59th-minute substitutes. a move straight from Barry Fry’s playbook. McCann started this game with a midfield diamond formation that was too easily exposed by the strong-running home wing-backs, most notably Kieron Freeman who was the right-wing source of both of Done’s early opportunities. The switch back to 4-2-3-1 improved Posh considerably with Da Silva Lopes and Chris Forrester orchestrating some lovely moves which tended to break down on the edge of the opposition penalty area when over-elaboration was again a problem. The home side had chances too with half-time substitute Stefan Scougall close to doubling the advantage twice before Done lobbed McGee late on before watching the ball dribble wide of his target. Genrally though Posh defended well after a shaky opening with central defenders Jack Baldwin and Michael Bostwick playing with great commitment and determination. Boxing star Kell Brook was in the crowd to watch his beloved Blades and maybe heard McCann describe his own side’s shooting as ‘powderpuff’. Marcus Maddison and co were certainly more Audley Harrison than Gennady Golovkin. It looks like being a closely-contested League One this season - Posh are ninth, five points off top spot, but just six points off the botttom - so a natural goalscorer could well make the difference between success and failure. Tom Nichols struggled to make an impact, understandably against three centre-backs in the first-half, and must be in danger of losing his place to rugged teenager Moore, but the return of Lee Angol from injury probably can’t come quickly enough for McCann. Posh: Luke McGee, Michael Smith, Jerome Binnom-Williams, Jack Baldwin, Michael Bostwick, Chris Forrester, Leo Da Silva Lopes (sub Callum Chettle, 59 mins), Paul Taylor (sub Gwion Edwards, 59 mins), George Moncur, Marcus Maddison, Tom Nichols (sub Deon Moore, 59 mins). Unused substitutes: Mark Tyler, Ryan Tafazolli, Hayden White, Nathan Oduwa. Sheffield United: Simom Moore, Jack O’Connell, Jake Wright, Kieron Freeman, Ethan Banks-Landell, Chris Basham, Daniel Lafferty (sub Stefan Scougall, 46 mins), Paul Coutts, Mark Duffy (sub John Fleck, 78 mins), Billy Sharp (sub Caolan Lavery, 84 mins), Matty Done, Unused substitutes: Aaron Ramsdale, Chris Hussey, James Wilson, Harry Chapman. Goals: Sheffield United - Done (13 mins). Cautions: Posh - Moncur (foul), Smith (dissent). Sheffield United - Sharp (foul), Basham (foul), Coutts (foul), Ebanks-Landell (time-wasting).